Some things you should know about this beta. 1. We have up/downvoting turned on instead of likes. SE5 also supports likes, and will support other custom reactions too, but for now we are testing up/downvoting here. This might change in the future. 2. The beta is clients-only, and we'll be bringing in small batches of people daily. The goal is to discuss the basic features/UI/bugs. 3. SE5 is extremely different from SE4, and they are really intended to be used for different use cases. Let's avoid comparisons, and focus on constructive feedback please. Thanks to the new hosted architecture, we can roll out features much more quickly than we could before! Thanks all. This should be fun! Gabry Yes Alex this is true "Let's avoid comparisons, and focus on constructive feedback please" but ... i don;t think is right to call this the new SE 5 ... you are making all your clients go crazy because no one understand anything what's happening in here ... SE for most of us means applications,options to interact between users in simple words all that is having SE 3,4. From your comments at least what i have read until this moment this is a sharing script ... we are taking the links from other big websites like Facebook etc. and put them on our websites ... and ? what can i do like webmaster ? only advertising for other websites ? thank you but i want my own website with my own stuffs and i don't think that making an website with this script i can make someone to register like my user ... if someone has already a lot of comments togheter with his friends on Facebook what can be the reason for him to come and share that subject also on my website ? Im sorry for disturbing with this comment but i think i have at least this right after spending more then 2500 euros for SE4 and now ....what ? Very disappointed and running i think to phpfox ... i had big dreams with your company but you will lose all with this ... thank you . Auwal You really shouldn't have called this one SE5. You should have gave an entirely new name. Nothing is wrong with the concept, just change the name and you can sell 2 products, one tailored as social graph and this one interest graph as Alex mentioned. Good work and keep it up. Why Arvixe is a recommended hosting for SEphp? There were few mentions that Arvixe is recommended for SEphp, because this company "offers optimized servers configured for SocialEngine". I have nothing against the company. There issues are usually fixed within a day or two by hosting support. But why are they there by default? Especially if they are officially recommended. I believe a lot of people expect servers are optimized already. 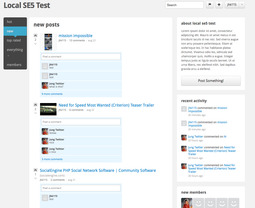 As a result their SocialEngine setup is slow and they think it's SocialEnginePHP issue. Please upvote this post. I hope somebody from Arvixe will notice it and they will update their default setup. Vex I've used Arvixe for over a year and they rock. APC is only on VPS or dedicated, but SE on their shared plan works great for me! Alex Benzer SE5 has native integration for Google Analytics. There's even a whole settings page dedicated to it in the admin panel. Drew Frey @Alexander , we've made it really easy to connect your Fan Page to SE5. 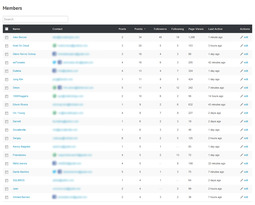 Just like with Google Analytics and Twitter, SE5 has this native integration already baked in. Thanks for the feedback! Hello! I have been seeing few comments and posts complaining about the "steam theme". Our templating system is extremely flexible. But this could sound like a PR statement. :) So to demonstrate this, I decided to make SE5 look somewhat like facebook in only about 5 minutes. Drew Frey Amazing [52,Jung Kim] ! So if this only took you 5 mins, just imagine the possibilities here! Members NEED ability to Edit Posts! [52,Jung Kim] [38,Shaun Harding] [250,Drew Frey] - Please include this feature. Members need to be able to edit title, and description/message. This should not be hard to do as the script allows admins to edit these items. If admins have their sites set to approve posts, you could require re-approval after edit. Community members - Please vote this up if you agree. [5892,SportzHype] [1007,VoiceBee] [2440,Robin] [6223,Arnfinn Ingebrigtsen] and everyone else on this community. Carlos Tabora Any update regarding adding the ability to edit posts in SE Cloud? liz Yes I agree. It's needed. Upload videos to YouTube using direct uploading. Direct uploading lets you add videos that are in your video library to YouTube. direct-upload implementation if you want to host or store videos uploaded through your site and also add those videos to YouTube. In a direct-uploading scenario, when a user uploads a video through your site, the video will be sent to your servers. Your application will subsequently send an API request to upload the video from your server to YouTube. Prasad Pawar Hey very Cool ! Alex Benzer Thanks! It's just the beginning... and this is just one theme. Tons of possibilities with the new platform! The SE5 admin panel keeps track of who is accumulating the most points, based on votes, likes, comments, etc. Here are the current stats for this site! We've just developed a leaderboard widget that will let you display this info right on the site, too! David Grubs Nice...makes a nice competitive community. are you using twitter bootstrap for design ? John Boehr Thank you! And yes, we are using bootstrap. Drew Frey Thanks a lot! Our team is developing our community in a slow but progressing pace to ensure that every important detail is captured and our community/SE Cloud is well developed before we launch our website in Q’4 2013. In fact, on Q'3 2012 we re-assessed our strategy; we decided to stop developing our community with the "SE PHP” platform and we successfully revamped our website development with SE Cloud. Now, I am pleased to contribute to the SE community with a trendy feature: “COLLAGE”. This new feature will improve the existing standards of SE cloud, is a new trend and will satisfy our immediate need of sharing multiple or a combination of photos, links, videos and topics. Also will provide a contemporary alternative to photo albums and will simplify the process of sharing multiple posts related each other. Please continue contributing with ideas and with feedback on opportunities for improvement. Together on this global community and in partnership with SE team we will make SE Cloud the best product in the market. If we support each other; we will deliver against our individual goals and will positively impact SE Cloud development to elevate the standards of our social communities with remarkable competitive advantage. 1. 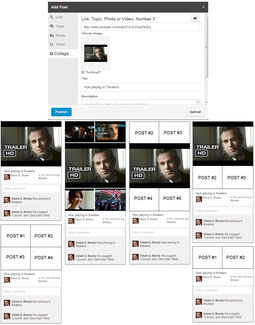 Ability to share multiple or a combination of photos, links, videos and topics. 2. We suggest sharing up to five different items in a single post. This will serve to avoid an infinite amount of items shared in a post and to maintain the integrity of mobile applications. 3. Even though we will share multiple types of posts; the post will only contain one title, one description and one category. 4. Posts will be shared in “4X6 size ratio- (will apply to Photos, Videos, links or topics)” and this ratio will not change independently of the amount of posts shared. This will help to share photos and videos without cropping the images which could create some complexity. 5. The arrangement of the posts or the design of the post could vary depending on amount shared. Please refer to the attached picture. 6. The category will also be visible and will be included with the post (i.e. under the title or the date). Please refer to the picture. 7. Photo of the author will also be visible in the post and preferable in front of the author's name. Please eliminate “by” located in front of the author's name. 8. "Collage" will be added into the "Post something" section and with similar format. Please refer to the picture. 9. If all posts are different, the links will be viewed individually in "Gallery viewer" and maintaining the main title and description. 10. If all posts are the same (i.e. all photos); the photos or videos will be browsed in the "Gallery viewer" as "carousel" to facilitate the navigation. Kimmie [134,Edwin Rivera] . This is definitely something they should be implementing as it's something we want to use for our site as well. Danny I agree that is cool ! Jeffuk Yes a cluster of stories, that would be a very good idea. where do I insert this code? Custom CSS?, Header? s.ziyad thanks[2440,Robin]. works great. but there is still the category called "Everything' in the drop down. how can i replace it with something else. I am very pleased with SE Cloud currently. The SE team has promptly fixed bugs and other items when I submitted support tickets. Is it 100% perfect yet? Nope, but it is 100% useable now. It can only get better from here IMO. 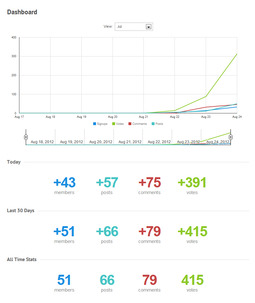 This script has more features and better mobile than the other pinterest clones out there. I have not reviewed reddit clones but I am sure it beats them as well. I will be adding at least 3 new SE Cloud sites over the next couple of weeks and in my opinion I am glad they are hosting the script, as it is costly for hosts that run fast when running numerous sites. Not to mention script costs, the only good pinterest clone script out there costs about $1200 with less features then SE Cloud plus add a host and cloud fees to run it. As you can see the SE subscription fee is the best option. A big thanks to the SE Cloud development and support team! Keep up the great work! Robin U're a crack [1134,Rick Von Ruden] , I've the same feeling. Even if I would prefer to merge both theme in one to keep in mind SE PHP and SE Cloud. Can you fall in love twice with SE? Edwin Rivera We echo your comments @Rick Von Ruden. SE team is delivering stunning results to grow our business and their business. They are playing to win and we should continue supporting them by providing feed back and by transitioning to SE Cloud (impresive so far). And together we will deliver the best product in the market and we will beat the competition (if we have competition ;)). I think there should be a "Send a Message" button in the user profiles, instead of typing the recipient name manually. Alex Benzer It's on our list! John Boehr Yeah, me too. It's right at the top of our to-do list.